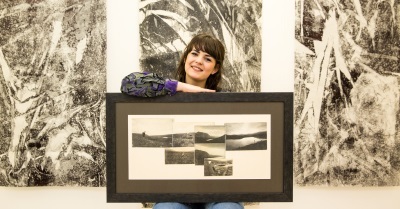 A profound connection to the Highland landscapes of home has led one Inverness art student to create a series of work which will go on display in Aberdeen this month. 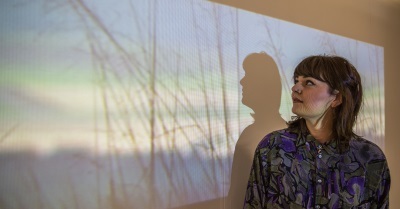 Lucy Michelle Hanna (23), is studying Contemporary Art Practice (CAP) at Gray’s School of Art and will unveil her work at this month’s Degree Show exhibition, which runs from June 20 to 27. She was inspired to create the work thanks to her love of the land, producing large prints, panoramas and a diptych projection. Lucy explained: “Having grown up in the Highlands I learnt about the beauty of the land and the rewards of adventure from an early age. “My late Grandfather, Alastair Fulton an artist himself, was a keen fisherman and lover of the Scottish landscape and so too is my Father. Both, to whom, I am thankful for my connection to landscape, specifically the mountains. The former Inverness Royal Academy pupil said the body of work she has produced for the Degree Show came from an attempt to capture the feeling that is experienced at the summit of a mountain. “You can see land for miles, you hear nothing but the wind, your self-awareness heightens, and the textures of the landscape, the way it reacts to or has reacted to the elements over the years – all of this is at the forefront of your mind,” Lucy said. Talking about her work, Lucy said: “Using monoprint, I created large prints much like a textural landscape or water source. The viewer’s subconscious or knowledge of the land will create a unique way of looking at these prints. Lucy added: “The diptych projection of wind-blown grass plays on a loop. Particular moments slow down as others quicken. The viewer is invited to question the way they see the weather’s effect on the landscape, and their role within that landscape. Lucy’s work will be on display as part of the Gray’s School of Art Degree Show, sponsored by BP for the twelfth year, which runs from June 20 to 27.